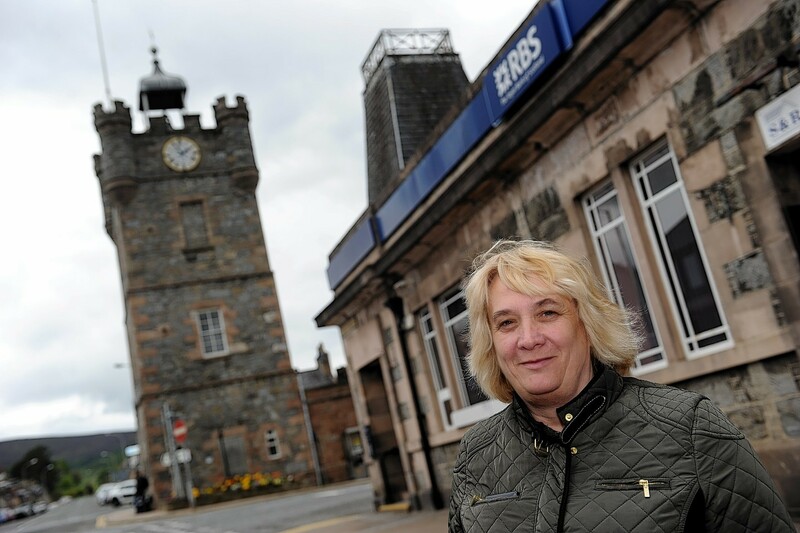 Lydia Williamson outside the now closed Royal Bank of Scotland in Dufftown. A north-east community that has already lost all of its bank branches will now receive fewer visits from a mobile service – as closures elsewhere place increased demand upon the vehicle. People in Dufftown were dismayed when the Royal Bank of Scotland (RBS) axed its branch there in 2015. The Moray town, which prides itself on being the malt whisky capital of the world, has since received visits from a mobile banking van twice a week. But from May, those visits will be halved to just one hour once a week as a spate of closures elsewhere – including in Banff and Huntly – mean that the vehicle will be tasked with covering a larger area. And the bad news does not end there as the pressure placed upon the soon to be minimal service could mean that transactions also take longer to process. The further reduction in banking access is likely to have a significant upon customer and businesses in particular. Moray MSP, Richard Lochhead, yesterday called for RBS to abandon that plan and maintain arrangements as they are in Dufftown. He said residents had “suffered enough” as there now isn’t a single bank building in all of Speyside. Mr Lochhead added: “Moray has been disproportionately hit by bank closures in recent years and nowhere more so than in Speyside. “Customers and small businesses in Dufftown rely on the twice weekly visit of the mobile banking van. “Any reduction in that service would be a huge blow to the community, and would frankly be unacceptable. Customers have also been advised that the processing of transactions may be delayed as a result of the change. The closure of the Huntly bank was announced in December, as part of plans to scrap 62 branches nationally, and it is scheduled to shut its doors on June 14. Its demise will leave customers facing a 60-mile round trip to Elgin to carry out transactions in person. The Banff building will close on May 23, with the nearest alternative more than 20 miles away in New Deer. Other branches will close in Dyce, Ellon, Bridge of Don and Turriff. An RBS spokesman said routes for mobile banking vans are “reviewed regularly, based on customer usage”.